2012 – year of the Black water Dragon – is considered that it will bring to people big prompt, but not always desirable changes. In symbolic of extraterrestrial civilizations the Dragon-Serpent is a symbol of global cataclysms. Water means that the epicenter of the first pre-cataclysm will arise in the ocean at coast of the South America in the Brazilian anomaly, in a place of the weakest magnetic field on Earth. Black – the color of mourning – means a lot of grief from the huge losses of people as a result of the first pre-cataclysm. Extraterrestrial civilizations since the dawn of human consciousness knew that the time will come when on Earth global cataclysms will start. However, on the other hand extraterrestrial civilizations also knew that the level of knowledge achieved by mankind at this moment, would not allow to understand the mortal danger of future upcoming changes. By this time the consciousness of humanity will reach a level that will allow to develop ultra-precise instruments. However, in order to estimate the danger of the current situation are required absolutely different knowledge - knowledge in the information world. Changes occurring on the planet are clearly visible in the information world, in the cell of the planet. Just these changes may reveal to humanity all subtlety of processes occurring in the bowels of the planet. The ability to see in the information world the work of consciousness of various objects is called «the information vision». 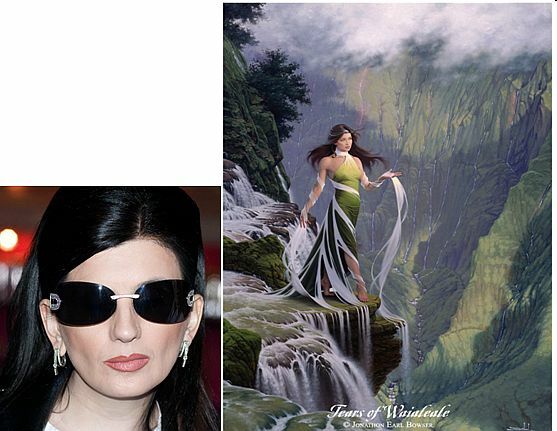 Information vision develops proportionally to development of consciousness. However at the initial stages of individual consciousness information vision develops very slowly. And only the formation of the united consciousness discloses information vision in full sight, allowing to observe work of consciousness of different objects and human being not only on the planet, but also in the universe. Such a sequence is associated with a huge opportunities offered by information vision. First of all, the information vision allows to operate work of consciousness - to slow the development of the defined processes or to accelerate them, as well as to stop and even reverse their development. However, such opportunities are not valid for the individual consciousness. They maybe owned, with the benefits for humanity, only to people with the united consciousness that makes develops compassion and mutual understanding. To see the change in the information cell of the planet is required to pass several cycles of consciousness on different planets. The civilization of Earth only for the first time makes the Transition from the individual consciousness to the united and therefore sees nothing in the information world. The civilization of the Earth is blind! And changes occurring in the bowels of the planet are mortally dangerous. Extraterrestrial civilizations within millennia built numerous complexes which represent the warnings about this final period of planet development. Thereby extraterrestrial civilizations open eyes of the Earth civilization on global cataclysms which will begin very soon. Global cataclysms is the mechanism of forced change of an individual mode of consciousness on the united. Extraterrestrial civilizations know that global cataclysms is the mechanism of the major stage of development of mankind consciousness applied in the universe – the transition of individual consciousness into united. This first transition is so difficult for humanity, that it passes on pain of death. The complete destruction awaits civilization if humanity would not unite consciousness and not make the Transition in the next cycle of life in time - before the second pre-cataclysm. The symbol of global cataclysms in symbolism of consciousness of extraterrestrial civilizations is the serpent. Analog and digital symbolic of consciousness on serpents. All serpents as pictograms of extraterrestrial civilizations are covered by analog and digital symbolic of consciousness. These are information cells of individual and united consciousness with expanded areas of a brain. Crescents and zigzags of the united consciousness. Symbols of destruction of a body area of information cell in the form of numerous strips which are crossing out area of a body; ovals of dematerialization and the Transition. Representation of the Principle of association of consciousness. A symbol of a cross meaning destruction of civilization with an individual mode of consciousness. The spirals representing all increasing number of people, uniting consciousness, expansions of a brain area at association of consciousness and other symbolic. However, by the image of the serpent extraterrestrials show not only danger of death, but also the way to salvation. The symbol of the Serpent has a head of a snake and feathers of a bird. This way the double information is transferred. The image of the serpent tells that attack of a snake is fast as a lightning and unexpected. This way extraterrestrial civilizations show that global cataclysms will begin suddenly for mankind. The only way for salvation is the Transition to the Highest level of the material world. This Transition extraterrestrial civilizations s represent to humanity in the form of birds flight. Therefore, the serpents’ body is covered with feathers of birds. The beginning of global cataclysms on Earth explains the Barkhausen effect. This effect occurs in ferromagnetic materials at certain intensity of magnetic field. It is known that core of our planet is ferromagnetic. The effect of Barkhausen shows spontaneous displacement of inter-domain borders which causes sudden jumps of magnetization. At the macro-level of the planet sudden jumps of magnetization reveals in the form of earthquakes, tsunamis, breaks of earth crust, volcanic eruptions and other natural disasters. Serpent is a symbol of global cataclysms in symbolic of consciousness of extraterrestrial civilizations. Extraterrestrials represent two main types of a serpent – with closed and open a mouth. They are the main serpents because they themselves represent global cataclysms – still sleeping in bowels of the Earth, or already ready to attack. Serpents with closed mouth mean that global cataclysms are included in the nature of the planet. Serpents with open mouth inform about the beginning of global cataclysms. Serpents with a long twisting body also portray cataclysms, however they transfer additional information, also vital. About approach of global cataclysms warn many complexes, which represent the image of serpents or their heads. Among them are the Mexican complexes of Chichen Itza, Xochicalco, the pyramid of the Feathered Serpent in the complex of the Sun and the Moon pyramids, Cholula, Tula and others. Serpents are set in such a way that you meet with them as if face to face, and they speak to you, angry and spitefully hissing and baring sharp teeth: Save yourselves, people! We are global cataclysms! Let's consider in details each type of serpents according to symbolic of extraterrestrial civilizations. Serpents with the closed mouth mean that global cataclysms are included in the nature of the planet. This type of serpents is most clearly shown in the pyramid of the Feathered Serpent in the Mexican complex of the Sun and Moon pyramids in the form of high bulk reliefs. In this complex are presented serpents only with the closed mouth. These are sculptures of serpents heads protruding from the walls. Heads are connected with a wall only by the border that separates them with a long body, easy to visualize. Moreover, in this pyramid are presented constantly alternating two types of serpents - Feathered and Fiery-Tlaloc. The muzzle of the Feathered serpent is opened and of the Fiery serpent is closed by a mask. Serpents with an open muzzle inform that their action will see each of us himself - it will be global cataclysms of incredible power, which for the time being peacefully slumbered in the bowels of the Earth. But the action of the Fiery Serpent, which face is closed by a mask, is hidden from people, and is unknown to them. However, just this unknown action of the united consciousness about which inform extraterrestrial civilizations in each pictogram wherever it was built, is the only way for salvation. Extraterrestrial civilizations take off a cover of uncertainty and mystery from the Fiery serpent and say: the laser beam - that is what our civilization should cause through the united consciousness in order to be saved. That is why this serpent is the Fiery. And you will fly up, like birds on the Highest level of the material world - continue this story feathers of the Feathered Serpent. Thus, the images of two serpentss, on the one hand, warn earth dwellers about the occurrence of cataclysms, but on the other hand, indicate the only way to salvation – through the united consciousness of civilization to cause the laser beam and to make the Transition on the Highest level of the material world. 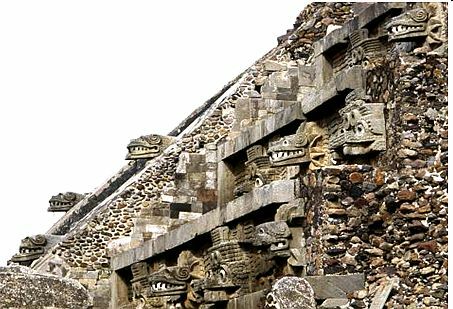 Numerous serpents heads installed on the Pyramid of the Feathered Serpent in Mexico sticking out everywhere from walls make terrible impression – as if simultaneously from everywhere on the earth get out hundreds, if not thousands of hungry blood-thirsty dragons ready immediately to swallow you. Meanwhile they have closed mouths, but what a trouble if they open them. 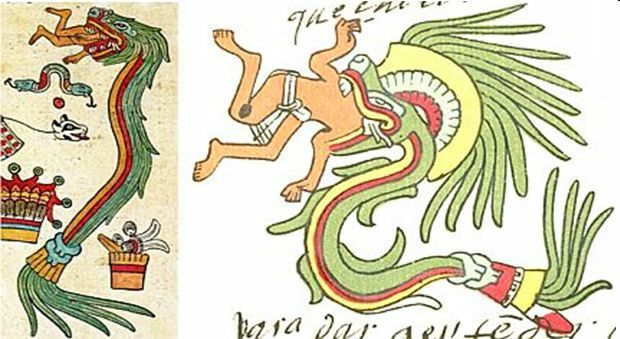 Thus, constantly alternating heads of two serpents - the Feathered Serpent and the Fiery Serpent - Tlaloc inform that the only exit out of this deadly situation is the Transition to the Highest level of the material world through the association of consciousness of all Earth civilization. • three-dimensional heads of serpents, in the form of high reliefs on the stairs and separate sculptures with long, horizontal or lifted upwards body. • flat serpents with long bodies, carved on the walls. Three dimensional heads of serpents with widely opened mouth are established everywhere in the Mexican complex of Chichen Itza. Three-dimensional heads of serpents with open mouths are presented also in other complexes of extraterrestrial civilizations. Extraterrestrial civilizations notice that serpents-cataclysms swallow people entirely and represent this information in numerous pictograms. The warning of extraterrestrial civilizations about the destruction of humanity by global cataclysms is transferred clearly by serpents in the mouth which is placed a man or a man's face. As shown in many complexes, the serpent swallows a man completely. This information is repeated several times in the pictograms on the walls of the Temple of the Warriors, in Chichen Itza, Mexico, in the complex of Tula and many others. This way extraterrestrial civilizations inform that global cataclysms, having started very quickly will completely destroy the civilization of Earth. This information that global cataclysms, having begun, very quickly will completely destroy the Earth civilization, extraterrestrial civilizations repeatedly transfer in various representations. About this tell many bas-reliefs presented on walls of complexes. Warnings about the death danger of occurrence of global disasters that destroy the Earth civilization, are also presented in the bright, colorful drawings. The Plumed Serpent eating people alive is based on five feathers. Thus it is shown that the basis of salvation from the global catastrophes is the Transition to other level of the material world through the united consciousness of Earth mankind. The united consciousness of civilization corresponds to the fifth level by the number of feathers on the tail of the Feathered Serpent. In some complexes extraterrestrials show also a third type of serpent - a flat, only slightly protruding above the surface of the wall. These serpents also represent cataclysms, but convey additional information too. Planar serpents are carved on the stone walls. They are often shown with a very long, curving body. The additional information is presented in the bends of the serpent’s body. For instance, sea shells or figures of the man sitting carefree in the bends of the serpent transfer vital information. Seashells informs that the epicenter of the first pre-disaster will be in the ocean. The same information represents the complex Chan Chan. In this complex by perpendicularly arranged high walls, decorated with ornaments of fishes, waves, currents, is indicated more accurately the information about the epicenter of the first preliminary cataclysm, the terrible harbinger of fast imminent start of global cataclysms. As pointed out by extraterrestrials the epicenter of the first pre-cataclysm will occur in the area of Brazilian anomaly, in place of the weakest magnetic field on Earth. Incredibly long wall of Chan Chan with depicted huge ocean waves and fishes, occupying almost the entire height of the wall represents a high standing wave of tsunami which covers huge territory and moves on the big distances. Simultaneously in the complex Chan Chan on the same walls is indicated the only way out of this deadly situation - the beginning of global cataclysms. This exit is presented in the form of birds, which are established one after another and form a horizontal line over the earth. 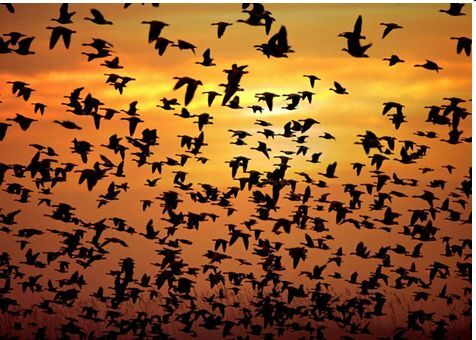 Birds show that mankind should fly up over global cataclysms from the level of Crystal Structures where we live now, on the Highest level of the material world – in the new cycle of life – the cycle of Correction. This is the only way to escape from huge ocean tsunami waves with fishes. The figure of a man sitting in crinkles of a serpents’ body, shows that global cataclysms will begin absolutely unexpectedly for mankind. In many complexes extraterrestrial civilizations inform that global cataclysms will begin absolutely unexpectedly for mankind. In the complex of Chichen Itza this information transmit serpents representing global cataclysms, located behind the back of the man. As the image of a carefree and implying nothing humanity is presented the statue of Chac Mool. Thus global cataclysms are depicted by two heads of serpents with the terrible open huge mouths, outstretched long tongues and the trunk raised straight up. They seemed to descend from the sky. In the Mexican complex of the Moon and the Sun pyramids global cataclysms, which will cover the entire Earth, depict the pyramid of the Feathered Serpent with numerous heads of dragons - each of them represents a separate type of natural blow in the system of continuous destruction of the planet - tsunami, eruptions of volcanoes, earthquakes, breaks of the earth's crust and many other catastrophes. Directly ahead of the pyramid of the Feathered serpent is located the huge pyramid with four tiers which represent the Earth mankind corresponding to the fourth level of consciousness. 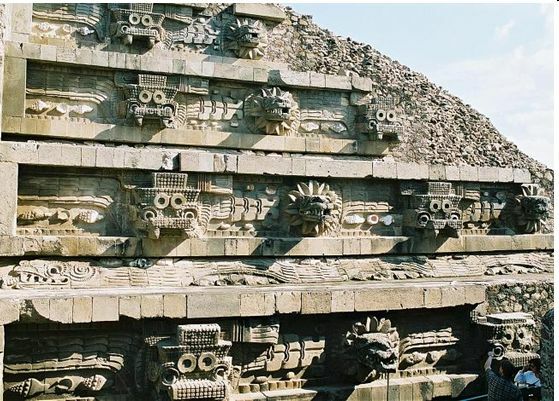 Consequently, the pyramid of the Feathered Serpent is located directly behind the pyramid with four tiers. Thus it is shown that global cataclysms are right behind mankind. This location of two pyramids repeats the information transmitted by complexes of Chichen Itza and Xochicalco. The pyramid with four tiers is below the pyramid of the Feathered Serpent and depicts the fourth level of consciousness of human being. The pyramid with four tiers transfers to the pyramid of the Feathered Serpent. It seems as if it is grown together with it. Thus it is shown that global cataclysms are intertwined with the life of mankind, and their power will be beyond the capabilities of mankind. Thus it is shown that cataclysms as though waiting for a carefree, unsuspecting humanity at the certain stage of development of the planet Earth, and their sudden and super-power blow from the behind will be deadly. In the complex Chichen Itza extraterrestrial civilizations indicate that the only way to save humanity is the Transition in a new of life to another level of the material world through the united consciousness of civilization. 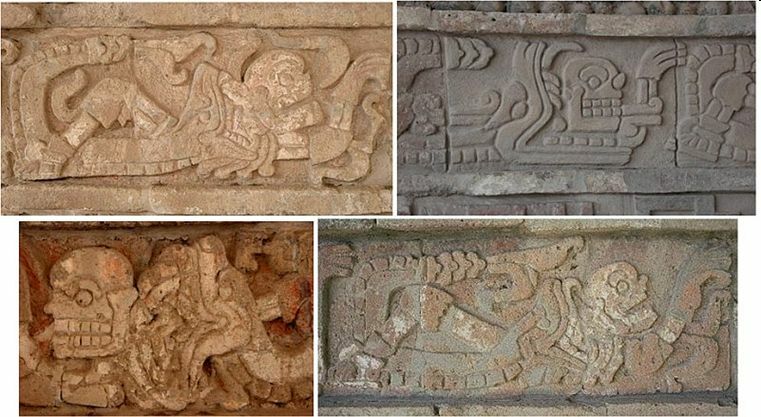 This information extraterrestrials clearly convey in the complex Chichen Itza in the form of the man, riding a serpent. Two statues depicting a man sitting astride on the dragon, are located at the top of the stairs of the Temple of the Thousands Warriors in Mexican complex of Chichen Itza. This way is shown the victory of humanity over global cataclysms. A man mounted on a platform above the serpent's head, covers by his hands a large disk, which depicts a cell of the united consciousness of civilization. This disc, featuring unification of consciousness, is presented also on the back of the same man and is shown in the central picture below. The similar disk representing a cell of the united consciousness of humanity with a huge brain area due to unification of consciousness of entire civilization, is located also on a stomach of Chac Mool. It indicates that humanity can conquer the serpents-global cataclysms only having made the Transition through association of consciousness of all civilization. 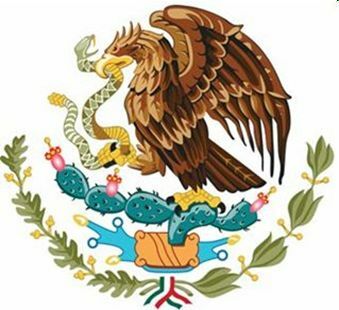 It is interesting that the eagle devouring a snake, is represented even on the arms of Mexico. This way is allegorically shown the great victory of mankind represented by an eagle, over the global cataclysms shown by a snake. Humanity as a bird should fly up over level of global cataclysms. It means that the civilization of Earth should make the Transition in the parallel worlds of the material world from the level of global cataclysms on the Highest level.